Introducing a dazzling new series premiere! The world’s pop-up masters invite you to peek inside the fairy realm as it transforms before your eyes. 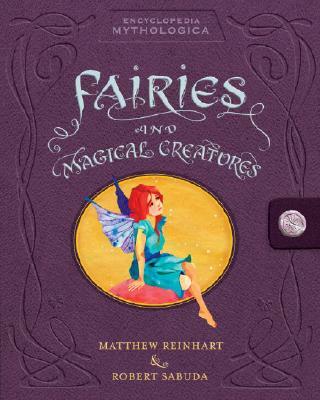 Open this entrancing book and meet Shakespeare’s Queen Titania, springing up with her silver wings aflutter. Further on, a crystalline elfin castle rises into the clouds, not far from some scary hobgoblins and trolls. And on a truly stunning spread, a humanoid magical tree spreads its branches to reveal a face within its foliage, while flowers unfold and rearrange their petals, turning into flower fairies. Visiting mythical beings around the world, from household brownies to the merfolk lurking deep below the sea, this breathtaking 3-D book, brimming with facts and fancy, will hold humans of all ages in its spell. Matthew Reinhart is the co-creator of the Encyclopedia Prehistorica series. He has also created many other award-winning pop-up books, including CINDERELLA, STAR WARS: THE POP-UP GUIDE TO THE UNIVERSE, and MOMMY? by Maurice Sendak and Arthur Yorinks. He lives in New York City. Robert Sabuda is the co-creator of all three Encyclopedia Prehistorica books. He is also the creator of many other stunning best-selling pop-up books, including AMERICA THE BEAUTIFUL, ALICE'S ADVENTURES IN WONDERLAND, and THE WONDERFUL WIZARD OF OZ. He lives in New York City.